Often times the last man standing is a position of courage and loneliness. It also means that you are one that captivates the audience. The super senior from Bloomington Zach Bradford fully understands being the last man standing. Coming into this elite championship his closest competitor home was Callan Whitehouse of Mahomet-Seymour who cleared 15-6. Bradford does not usually warm up until the bar is over 16-0. Last weekend at the Centennial Invitational, Bradford warmed up at 16-6 as a prelude to NBNI. He went on to clear 17-4 as part 1 of a two meet experience on the same day. Since he does not often compete in other events, it appeared logical to travel to Chicagoland and participate in the Windy City Pole Vault Summit. The goal for New York was to stay focused on the vision of clearing 18-feet. "I want to clear 18-feet indoors and outdoors," said Bradford prior to the indoor championship. The main competitor and center of hype was friendly foe KC Lightfoot of Lee's Summit HS in Missouri. Both competitors played mental chess passing on every height until the majority of the field was eliminated. Third placer Max Manson of Colorado topped out at a very respectable 16-9.25. Bradford and Lightfoot entered and cleared 5.01m (16-5.25). Lightfoot passed on the next height 5.11 (16-9.25) while Bradford made it on the first attempt. Bradford needed two attempts to clear 17-1 (5.21) while Lightfoot got it with just one. The next three heights were successful for both to reach 17-9 (5.41). Lightfoot tapped out trying to clear 5.50 (18-0.50). Bradford needed to clear the height in order to win the grand event and reach his goal. It was an electric moment where the track and other field event action paused for a moment. All eyes was on Bradford... he cleared it on the final try!!!!!! The Armory went nuts and Bradford with a huge load off of his shoulders was relieved. He ran over to hug his support team after acknowledging the legion of appreciative fans. He obliged the masses by attempting 5.54 (18-2). Though he did not get the height, he became only the third vaulter in US prep history to clear 18-foot indoors. The other two are superstar record holder Mondo Duplantis and import Sondre Guttormsen who goes to school in California but is from Norway. It is Bradford now that holds the US#2 mark and sweet redemption from some of the naysayers. Connor Artman (Illini West) earned All-American honors in the boys long jump with a 6th place finish. Though he was not entirely pleased by not surpassing 24-feet, Artman has be reflective on what 23-1.75 means. Marcellus Moore (Plainfield North) advanced to the 60m semi-final with a solid 6.87. It may pale in comparionson to the Floridian speedster Anthony Schwartz who blazed an Armory record 6.63- tied for #3 all-time among several performers. "Baby Holyfield" would later win his 200 prelim in 21.52 to advance to the final. It will be a great Sunday show for Moore who continues to amaze as a sophomore. Dajour Miles (West Aurora) made her Armory debut an overall success. The opening of her 400 was a little shakey on the first lap as Miles' lack of full aggression was met with path intrusion. "Cinnamon" was not having it though. She made a strong move late on the backstretch and put an end to her fan's stress level winning the section 5 in 54.92. Miles passed on the 200m to concentrate her efforts in the two-lap final. Amira Young (Chicago Whitney Young) did not fare as well in her 200 prelim (25.11) as she did during the morning session 60m first round where her 7.60 pushed her to the semis. Young may or may not make the final which is loaded with the fastest girls in the country, she will have an opportunity to take over the state lead which is 7.58. 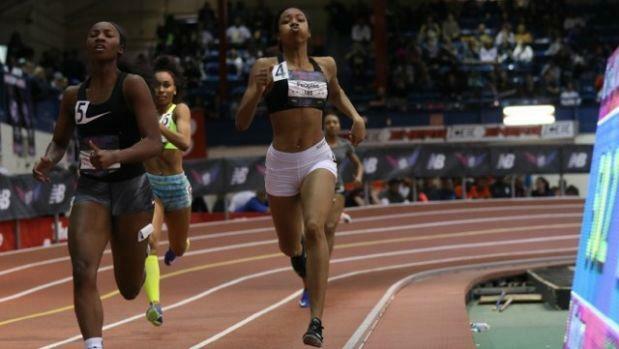 Imani Carothers (Chicago Brooks Prep) dropped a big personal best in the 60HH 8.47/US #10. Carothers moves to the semi-final. Later Carothers competed in the long jump and finished a disappointing 13th place with a leap of 18-5.75. Chloe Lindeman (Fulton) was a late entry into the shot put championship. Surprise! Lindeman took off and had the performance of her career placing 3rd with a 47-2.5. Because Lindeman had a foul on her record she was awarded third- Payden Montana of Pennsylvania also tossed the ball 47-2.5. The winner was Zyra Thomas of New Jersey at 47-5.75.